In recent years, educationalists have fretted over two main problems with the English exams system. It has been blamed for "failing" the many young people who leave school at 16, lacking the qualifications needed for the modern world of work. The system has also received criticism for failing to distinguish between bright students and the very brightest. Universities in particular say it is hard choose high-quality candidates. You could add a third: there are simply too many exams. The latest plan, from former chief inspector of schools Mike Tomlinson, purports to offer a solution. How does it fare within the context of previous changes? BBC News Online looks at the changing nature of exams and educational provision during the last 134 years. 1870 The Education Act requires the establishment of non-denominational elementary schools - for children aged five to 13 - nationwide. Schools can charge pupils no more than nine pence a week. 1880 Attendance is made compulsory until the age of 10. 1891 Elementary education effectively becomes free. 1918 Leaving age is raised to 14. 1944 Butler's Education Act seeks to encourage the "spiritual, mental and physical" well-being of the community. It creates the "tripartite", hierarchical system of grammar, technical and secondary modern schools. Selection is decided by an exam taken at the age of 11. Meanwhile, the school leaving age is raised to 15. 1951 General Certificate of Education (GCE) O-levels and A-levels are introduced, replacing the School Certificate and the Higher School Certificate. 1964 Harold Wilson's newly-elected Labour government promises to set up comprehensive schools, combining pupils of all ability levels. In 1976 another Wilson administrations compels all local authorities to introduce these. But this legislation is repealed by the Tories in 1979. 1965 The Certificate of Secondary Education (CSE) is introduced for secondary modern pupils, to cater for those not sitting O-levels. 1988 The General Certificate of Secondary Education (GCSE) replaces O-levels and CSEs. The National Curriculum, stipulating subjects to be studied until the age of 16, is also introduced. 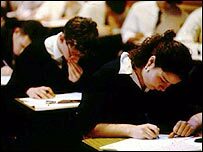 1994 An A* grade is added to GCSEs to differentiate between top and lower A grades. 1995 The government introduces National Curriculum Tests, often called Sats, for all children aged seven, 11 and 14 ( tests for seven year olds were first tried in 1991). 1996 General National Vocational Qualifications (GNVQs) are offered as a more work-based alternative for non-academic students. 1997 The National Literacy Strategy, aimed at raising standards to those of the UK's main competitors, is introduced for primary schools in England. 2000 Advanced Subsidiary (AS-level) exams are brought in for 17 year olds. These are qualifications in their own right but also a halfway stage in the A-level course, unlike the Advanced Supplementary exams they replace. Plans are also revealed to replace the lower tiers of GNVQ with vocational GCSEs, with the stated aim of putting academic and vocational education on a par. 2002 Several hundred A-level papers are regraded amid fears the reforms have been rushed through. 2004 Mike Tomlinson, the former inspector of schools in England, proposes replacing GCSEs, A-levels and the "soup" of vocational qualifications with a four-part diploma for 14 to 19 year olds. It calls for "core skills", such as numeracy and literacy, to be compulsory before pupils can qualify. The plans would alter the English education system more radically than any others since 1944. However, Mr Tomlinson says the changes will be "evolutionary, not revolutionary", taking around 10 years to implement.